Part of the reason I put off getting one for so long was the expense. 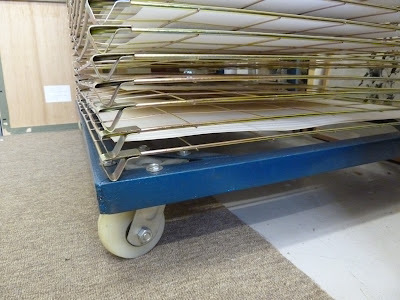 New print drying racks can cost £1000 and even second-hand ones are usually several hundred pounds. I’d been looking on ebay for a while and even bid on a few but I didn’t want to pay more than £200. Then I found a supplier based near me who was selling them for £175 new. I couldn’t believe my luck! They are called it-marketing and are based near Maidstone in Kent. It-marketing are mainly a supplier of balloons, which is why I have this beauty attached to the rack (I had to ask for one didn’t I?!) They will deliver the rack for an extra £45 (ready assembled) but I picked one up and assembled it myself to save on costs. It only just fit in the back of my estate car though! The rack has 50 shelves and will take paper up to around A1 size. The actual size of the usable area of each shelf is 60 x 100cm (23.5 x 39.5 inches) but you could have longer prints sticking out of the sides. 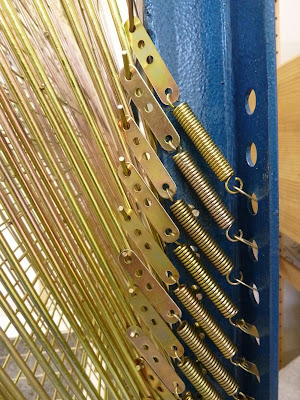 Each shelf is supported at the front corners and in the front centre by a little metal separator. This does mean you can’t remove large prints from the shelves unless you lift them up and also you can’t have prints sticking out of the front unless they are less than half the width of the shelf. Generally I am pretty happy with the rack. I don’t think it would last very long in a college print room but for my purposes it is perfect. It’s perhaps not as well built as the ones I used at East London Printmakers but it doesn’t squeak and it’s not full of random unclaimed prints! One nice feature is that each spring (which holds the shelf in the up position) can be attached through one of three holes, so as the springs get old and loose you can tighten them. 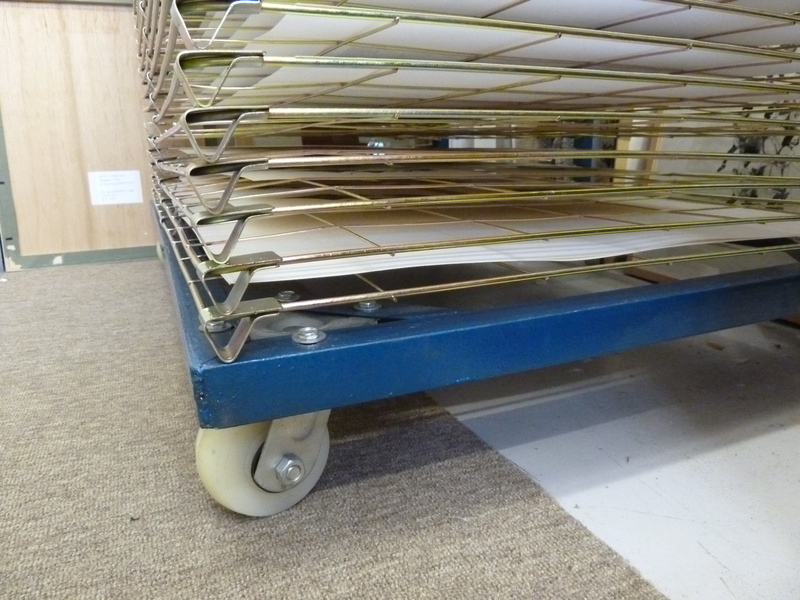 The rack also has wheels so you can move it around the studio. This is very useful as you can put it out of the way when you’re not using it and position it next to you when you’re printing. There is one design flaw to the rack. At the back centre of each shelf there is a spine that holds the shelf in position. 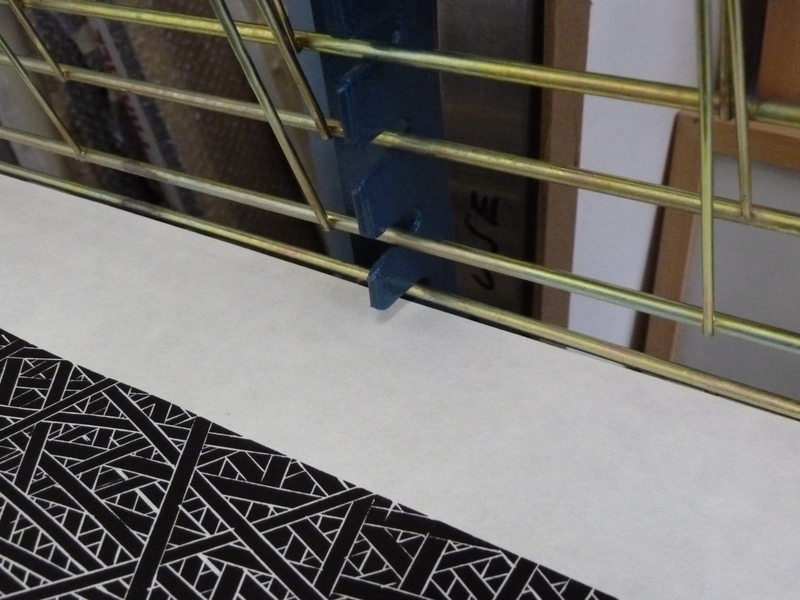 This means the print can be trapped in the gap when the shelf is lifted, damaging the paper. I think this can easily be over overcome with a little addition of a piece of thread or tape over each gap. 13 Responses to Print drying rack for my studio. That's a great little rack – especially for the money! However did you manage so long without one? Mariann (Cascada Studio, Mijas – see my recent posts about my visit!) uses the large metal wall-shelves, from Ikea's range for laundry/utility rooms. They're pretty good and you can move them up and down the wall racks, or add more in between. You could fit pretty big prints on these too. 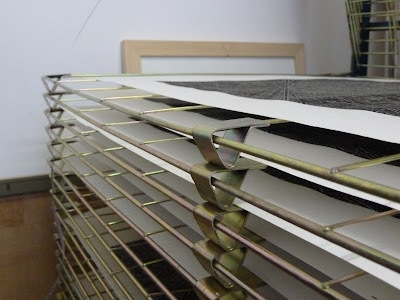 I have some of these in my loft and I plan on rigging them up at some point soon (they were originally bought to store my paper… not a good plan, paper is heavy… see my Disaster Post from February 2011!). 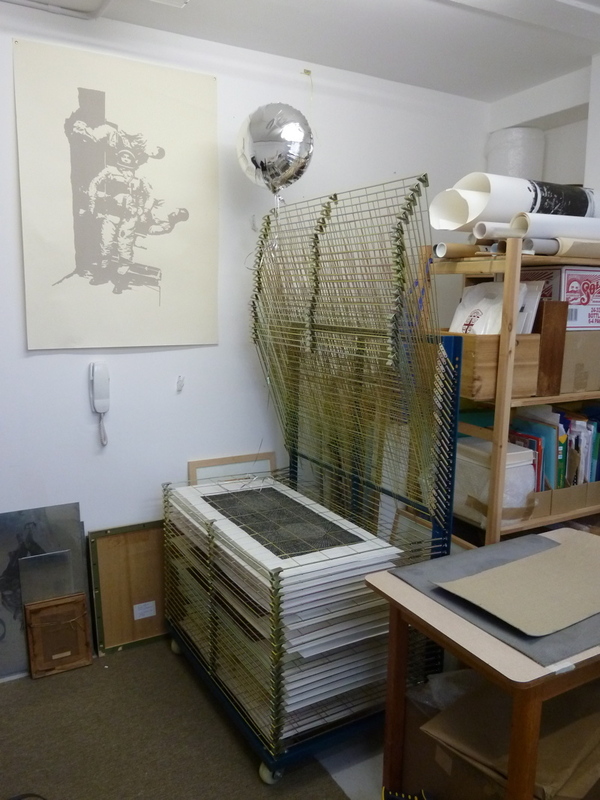 Still, I think I would like a nice little drying rack some day (when I have room for all the kit.. a “real print studio”. 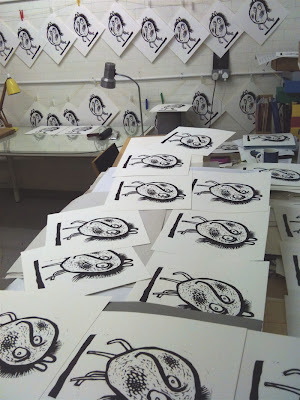 My current studio is a bit of a squash for bookbinding, let alone printmaking. Trying to find a nice little press, which can be stored easily, but doesn't cost £700 because it's portable! Hmmm.. Mind you Nick, there's something rather cool about rows of prints, all pegged up on strings, drying in the breeze (! ), while you duck under them with your cuppa and sarnie… Not so practical, but still quite fun. Enjoy the new rack – sounds like you've earned it! Soooo happy for you! Sooooo jealous! Hello! your drying rack is awsome and I would like to get one like that. Do you have the contact details for’it-‘marketing’? Can’t find their website or any reference to them. It doesn’t look like they still sell them, sorry! they are still selling them on ebay and just got one – great blog/blog post and thank you! 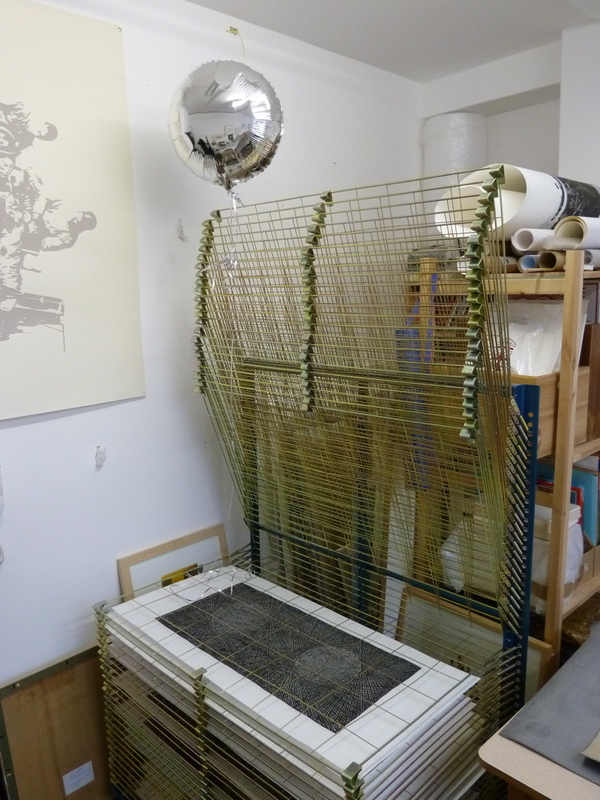 Will be using it for printing textiles and I know that studio chaos very well! Thanks so much for your post-I’m a screen printer based in Notts. I’ve just moved into a studio and was casting round for print racks- yours is just the sort I need at a price I can afford. Yay! Glad this was of use. Thank you so much for this info. I have contacted it-marketing via eBay and they say more are on the way and they will let me have one when they arrive. Brilliant: just what I need for my studio at home. All the very best and thanks for your most interesting blog. They sell them still, but for nearly double the price now 🙁 I don’t understand how these sellers think most artists can afford such a high price for these racks…I’m making one myself! Still on eBay for £249.00 , so not double the price and it is 4 yrs later.